By now nearly every American who pays attention to the news has heard about the enormous national debt and the annual $1.5 trillion budget deficits, and realizes that the US has a serious spending and debt problem. We owe $14 trillion and routinely spend 40 percent more each year than we take in, which increases the debt even more. To sensible people, that signals a strong need to make substantial changes. But not Washington Democrats. They see the solution to our unsustainable national spending addiction as essentially maintaining the current level of spending, with maybe a little trimming here and there, then increasing taxes on the rich. They don’t want to reduce support payments or services to their constituents and risk losing votes, and they believe that increasing government revenue through tax increases on the wealthiest Americans is the way to fix the problem without reducing government handouts. This supposed solution is based in fantasy, and is not what sensible people that find themselves in a similar situation would do. Smart folks would realize they had created a financial crisis through foolish spending practices and they would reduce spending to cover just the necessities; try to find ways to increase income, perhaps through working an additional job or trying to get a better-paying job; or sell some things they don’t really need. In short, they would make the necessary sacrifices and endure the pain until things smoothed out.If they weren’t smart, they would probably just keep spending too much and tell their employers they need more money, which parallels what the Democrats want to do. Those folks would soon declare bankruptcy. And so, instead of spurring private sector expansion to broaden the tax base and increase tax revenue, and paring down spending to match income, the president and congressional Democrats prefer to simply make the rich pay more by increasing their tax rate by 13 percent. What does that mean to a person at this income level? A married person, earning $1,000,000, with two deductions, and taxable income of $986,800 pays almost $323,000 just in federal income taxes. If President Obama succeeds in raising the top tax rate of 35% to the pre-Bush tax cut level of 39.6 percent, this person will pay an additional $45,000 in income taxes each year. Democrats reason that folks in this income range have more money than they need, and won’t notice a few tens of thousands of dollars more in tax payments. But that analysis defies common sense. People routinely use the money they have available, regardless of how much that might be. Perhaps the wealthy are like everyone else in that regard. So, what would the person who earns a million bucks do with that $45,000 if the government didn’t take it? Would they stuff it in their mattress, bury it in the yard, or hide it in their freezer? No, they would invest it in business, or securities. They would donate some or all of it to charity, or purchase things they want and need, like household goods, a car, a boat, or a house. They would put it to some productive economic use, which is far more beneficial than having Uncle Sam confiscate that $45,000, and much of it be used to pay bureaucrats to disburse it through government spending, which is highly inefficient and often wasteful. The tax hike so cherished by the president and fellow Democrats is a response to the impulse to punish the wealthy for being successful. But doing away with the Bush tax rates for high income earners would produce only $500 - $600 billion over 10 years, a meaningless sum when compared to budgetary spending of more than $3 trillion a year. Even if the government confiscated every cent millionaires and billionaires made this year – about $685 billion – it would be less than half this year’s budget deficit, and just one-fifth of annual spending. 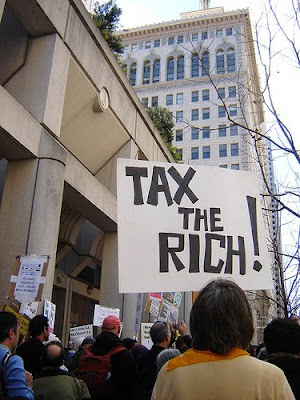 Raising their tax rate will encourage the wealthy to look for ways to shelter that money from taxation. This obvious reality escapes those on the left, who do not understand the capitalist system, but think they know how to change it to make it better. Their past efforts to improve capitalism are responsible for all of our current problems. But just because raising taxes on the rich makes no sense economically doesn’t mean it has no value at all. Which is why President Obama is busy trying to foster envy of the wealthy among those who aren’t wealthy: it pays off at the ballot box. It’s a very pathetic situation that these parasites are allowed say whatever they want to and these isn’t any, not one elected official who has the guts to come out and say what must be said about it. Jacking up tax rates also ignores the myriad ways that policy can raise revenue while enhancing, rather than harming, economic productivity (e.g., elimination of the home mortgage interest deduction). Similarly, the focus on tax rates detracts attention from policies that advantage the rich by restricting competition, enabling crony capitalism, or handing large tax breaks to politically connected interest groups. Holding back on tax cuts to "job makers" shouldn't be patronized, especially with the steadily dwindling economy. A fair matrix should be devised to in taxing the rich as they should be. Taxing more the highly productive Americans is indeed counter-productive. It will have a serious repercussion.